Jacob Larsen has become an efficiency machine. If you checked the pulse of Zag Nation a week ago, the sky was falling. A pesky squad from North Dakota took them to the wire, and after a return to the norm against IUPUI, the Zags dropped a road game to San Diego State. Well rest easy, because a little bit of conference play is all the Zags needed to look like the same old dogs. Playing against the WCC preseason poll's 8th-ranked Pacific and 5th-ranked Santa Clara, the Zags posted a winning margin of 82 points and it arguably wasn't even that close. Santa Clara specifically hasn't lived up to their preseason ranking as they now sit at 4-10 and saw the Zags score the first 15 points of the game. However, Santa Clara is 1-1 in conference, defeating Gonzaga's next opponent, Pepperdine, last Thursday. 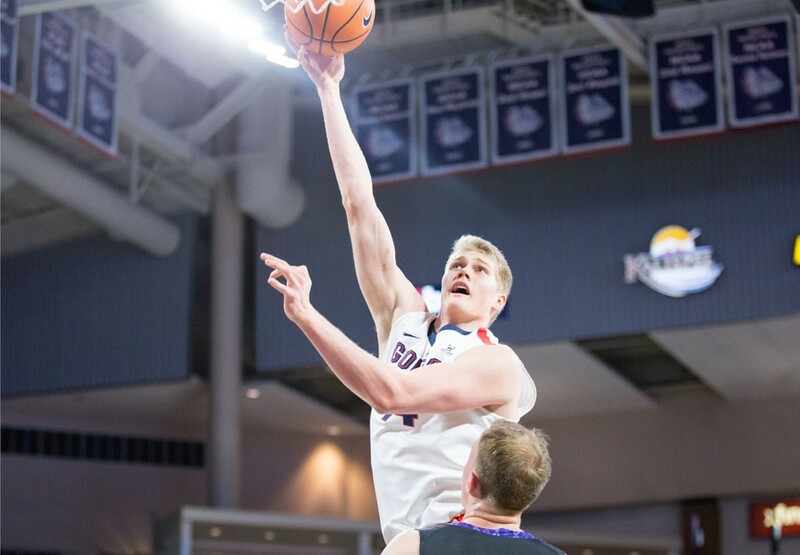 The drubbing put on this last week has reinvigorated discussion in how Gonzaga can turn the second half of their season into something productive. Spokesman-Review's John Blanchette wrote about the idea of reducing the amount of games the Zags would play in conference. Unfortunately, any reduction also jeopardizes the few meaningful games in conference for the Zags. What happens if a scheduling lottery sees one game apiece between St. Mary's and BYU? There seems to be no clear solution. Basketball—while a NCAA moneymaker—isn't quite football, and hoping for a limited yet beneficial WCC run would appear as fruitful as having your track team to fly out and race against Butler, Villanova, Providence and the rest of the Big East. Playing these lopsided affairs is a great way to get your bench solidified, though. Efficiency monster Jacob Larsen and point guard heir-apparent Jesse Wade made early appearances in both games. With Wade, his shoulder injury and practice time has greatly affected his placement in the rotation, and Larsen could ultimately be a great plug-in for Few when Killian Tillie and Johnathan Williams III are off. Commenters and fans were clamoring for Wade due to a rough night in San Diego for junior guard Josh Perkins. Like Williams after a difficult go against Villanova, it was easy for naysayers to look at the upperclassmen's performance and believe benching the first options would be an ideal way to "teach them a lesson" or at least let the team see what else they had. The mindset ignores the fact that Perkins has the thankless job of running the offense and letting his front-court facilitate the motion and progression of the possession. On top of that, a minor bit of research would show that Perkins as a junior takes care of the ball as well or better than guards of Gonzaga past. Perkins' 5.4 assists and 2.7 turnovers (+2.7) is a larger margin than former great Kevin Pangos' junior season assist-to-turnover ratio of 3.6-1.7 (+1.9). It took over 40 minutes of play for Perkins to have his first turnover after the San Diego State game. It occurred in the second half Saturday night, a game where he finished with 8 assists and 2 turnovers. On top of that, the two games showcased Perkins' torrid three-point pace, nailing 8 of his 17 shots from behind the arc. Through 15 games he's shot 47.5%. For perspective, last year's closest were Tillie and Zach Collins shooting around 47% on 0.7 and 0.5 attempts per game respectively. Perkins is attempting 6.7 threes a game. The numbers are moving past anomaly. Another treat of the tandem games was that Gonzaga accelerated and didn't look back. Young teams in the program have a history of allowing less adept teams to hang around with them. That concern was validated with the North Dakota and San Diego State games. But Saturday night's Santa Clara game proved that the group (113th least experienced in Division I, according to KenPom) was more than capable to get on the gas on not let up.